Like a lot of people I started the year with new goals to improve my physical and mental fitness. Writing this blog has helped me keep on the path to better health. I’ve also employed a few apps on my phone that have helped keep me on track too. Only one of them was specifically built for the purpose of helping people improve their health. The other two I’ve used to help me even though they weren’t necessarily built as fitness apps. The first app that I have been using is Google Keep. I’ve used this for years to remind myself to do specific tasks during the day. This month I’ve been using it to remind myself to do some push-ups every morning. Here’s a video that shows you how to use it. The only complaint that I have about Google Keep is that it will only remind me at a time that I have specified. That can lead to the “alarm clock response” where I just slap the snooze and say “in five minutes” five times. To avoid the “alarm clock response” I started using an app called Randomly Remind Me (Android only). This app lets me set a time frame in which I want to receive random reminders to do something like push-ups or stretching three or four time per day. The benefit of this app is that I don’t know when I’ll get the reminder so it can have the effects of either snapping me out of a funk or reminding me that I need to get my push-ups done. Watermaniac is an app that I started using at the start of the second Ed Tech Fitness challenge. This app lets me set a goal for the amount of water that I will drink throughout the day. Once the goal is set the app will remind you at half-hour intervals to drink water. You can log your water intake in the app. I don’t log my intake, I just drink the water when the app reminds me (usually). I have to say that I rarely do the tasks exactly when the reminder appears. And at first it was annoying as heck to have three reminder apps going off throughout the day. But what I have come to realize is that having those apps remind me throughout the day has the effect of subliminal messaging to build into my mind that I need to drink water, stretch, and exercise throughout the day. 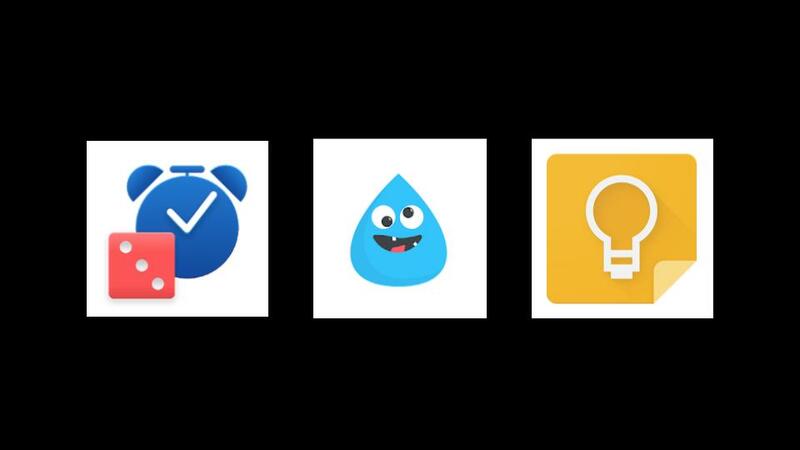 That’s how these three apps have helped me keep on track with my New Year’s Resolution. How have you done with your New Year’s Resolution? Are you using any apps to help you keep on track? If so, share them in the comments for everyone to learn about.